Overall the Fire Island real estate market saw another strong year in 2017. A typical year sees 99 transactions per year, but in 2017, 137 Fire Island homes were sold. While that does represent a 13% year over year decline from 2016’s very brisk volume of 157 sales, when put into historical context, 2017 transaction volume was 38% greater than an average year. Additionally, we may see a few more 2017 sales come through recording, which should bring the year over year sales volume numbers closer to parity. 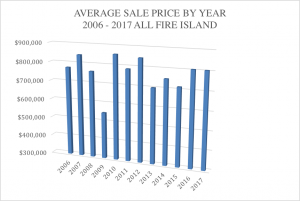 The highest price paid for a home on the island in 2017 was $1,850,000, which is nearly 50% lower than the highest price paid for a Fire Island home in 2016, which was $3,600,000. It is also 26% lower than the 12-year average of the highest price paid in a given year since 2006, which is $2,516,917. The only year since I began collecting data where the highest price paid for a home in that year was lower than 2017 was in 2009, where the highest price paid topped out at $1,200,000. The lack of activity at the very top end of the market is somewhat unusual, however does not seem to be symptomatic of performance in the rest of the market. 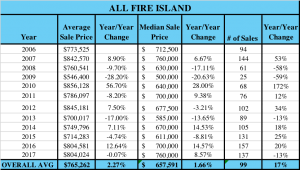 Because of the relatively small size of the Fire Island market, when we see transactions in the 2 and 3 million dollar range, it can skew the overall averages upward fairly significantly, so the fact that the average sale price remained essentially the same year over year even though there were no high value sales (defined as $2 million and over) shows that price performance in 2017 was actually stronger than the average sale price would indicate. In fact, when we look at the median sale prices, 2017 outperformed 2016 by 8%, with a median sale price of $760,000 as compared to 2016’s median price of $700,000. Although the very high-end of the market saw little activity, this indicates strong market performance in the middle and lower segments of the market. Because the median is not skewed by outliers as the average is, it can be a more accurate measure of market performance. The 2017 median sale price of $760,000 is (tied with 2007) the highest median sale price seen during the data collection period. Evidence of this trend is also seen in the fact that several communities saw a drastic rise in price point for the lowest price sale of the year, indicating that inventory at the lowest segment of the market has largely cleared. To put the 2017 market data into perspective, it is helpful to look at sales figures relative to the entire period of data collection in addition to comparing to the previous year’s performance. In addition to looking at the island’s overall market performance, it is useful to examine the data on a town by town basis. Atlantique saw no sales activity in 2017. A small community, Atlantique usually sees 1 sale per year. The average sale price over the past 12 years in Atlantique is $589,323. Cherry Grove had another solid year in 2017, with 10 homes trading, as compared to 11 homes in 2016 and a historical average of 8 per year. The average sale price in 2017 was $545,600, which was up 6% from $516,550 in 2016, and up 1% from the 12-year average sale price of $538,447. The least expensive Cherry Grove property to trade in 2017 was $260,000, up 49% from 2016’s lowest price of $175,000. Two homes sold in Corneille Estates in 2017, as compared to 4 homes in 2016. Even though the number of sales declined by 50% year over year, 2 sales per year is average for the community. The 2017 average sale price was $840,000 which is 27% higher than 2016’s average sale price and 21% higher than the last 12 year’s average sale price of $697,087. 2017’s lowest price Corneille Estates sale of $820,000 was more than double 2016’s lowest price sale of $400,000. The highest price paid for a Corneille Estates home in 2017 was $860,000, up 13% from 2016’s high price of $762,500 and up 17% from the 12-year average high price of $732,955. Sales transaction volume in Davis Park doubled in 2017, going from four sales in 2016 to 8 sales in 2017. The average sale price rose by 10% from $521,250 in 2016 to $571,529 in 2017, and was 12% higher than an average year. The highest price paid for a home in Davis Park in 2017 was $875,000 which was a 37% increase over the previous year, and 21% higher than the average highest price paid in the last 12 years. No homes sold in Dunewood in 2017. A small community, Dunewood typically sees only one home sale per year. In the last 12 years, the average sale price in Dunewood was $742,452. Fair Harbor had a very strong year with 13 sales in 2017, representing a 30% year over year increase in sales volume and a 63% increase over the 12-year average of 8 sales per year. The average sale price was also up 19% year over year, to $801,148 in 2017 from $671,148 in 2016. This is a 22% increase over the historical average sale price of $658,840. The highest price paid in Fair Harbor in 2017 was $1,760,000, which is 83% higher than the highest price paid in 2016 and 69% higher than the highest price paid in an average year. The lowest price paid in Fair Harbor in 2017 of $550,000 is 80% higher than the lowest price paid in Fair Harbor in 2016 of $304,979. The Pines market remained remarkably steady from 2016 to 2017, with 27 homes trading hands in both years and the average sale price remaining with a quarter percentage point, year over year. The average 2017 sale price was $1,001,569, which is less than 1% shy of the 12-year average sale price of $1,008,788. Like the similarly priced communities of Seaview and Saltaire, the Pines saw a similar trend in the highest price paid for the year being much less than the 12-year historical average. The highest price paid in the Pines in 2017 was $1,850,000, down 40% from 2016’s high price of $3,070,000 and off 18% from the 12-year average sale price of $2,242,458. The lowest price paid in the Pines in 2017 was $550,000, which is 57% higher than the lowest price paid in 2016 of $350,000. Interestingly, we see the exact same data pattern as Seaview and Saltaire, when looking at the median price points. Even though the average sale prices saw almost no change, the median sale price increased by 9.5% from $840,000 in 2016 to $920,000 in 2017. This in combination with the lack of high end sales, indicate the market was driven by strength in the middle segment, whereas 2016’s market performance was buoyed by a handful of high priced sales. Kismet saw solid price growth, with an 8% year over year increase in average sale price. While the number of sales declined from 7 in 2016 to 6 sales in 2017, that still represents a sales volume of 20% greater than an average year. The average sale price increased from $636,429 in 2016 to $685,667 in 2017. The lowest price paid for a Kismet home was 9% lower in 2017 than in 2016, but was 19% higher than in an average year. The highest price paid in Kismet in 2017 was $885,000 which was 4% higher than 2016’s high price paid of $850,000. 2017 saw 9 home sales in Ocean Bay Park at an average sale price of $640,611. In comparison, 2016 saw 16 Ocean Bay Park home sales at an average sale price of $780,688. However, comparing these measures year over year is misleading, due to the fact that several condemnation sales of oceanfront homes took place in 2016 in order to facilitate the dune restoration project that will be completed this year. Owners of the condemned oceanfront properties were paid market value for their homes by the county, resulting in an upward skewing of the 2016 sales data since the proportion of oceanfront homes (which naturally command a large premium relative to inland properties) sold in 2016 was so much greater than in a typical year. 2017’s average sale price was down 18% from 2016’s average sale price of $780,688, but when the oceanfront condemnation sales are excluded, 2016’s average sale price was actually only $618,000, indicating that the year over year average sale price actually increased by 4%, and was 26% higher than the 12-year average Ocean Bay Park sale price of $509,255. Ocean Bay Park continues to gain desirability as former share houses are being bought up and converted into luxury family homes or high-end rentals. The lion’s share of the island’s 137 sales took place in Ocean Beach, with 38 homes changing hands in 2017. That represents a 16% decline from Ocean Beach transaction volume in 2016 which was extraordinarily high at 45 homes. Since 2006, the village has seen 21 homes sell per year on average, so even though year over year volume was down, 2017 saw 81% more Ocean Beach home sales than a typical year. As one might expect in light of the continued strong pace of sales, Ocean Beach sale prices were also up in 2017. The average Ocean Beach sale price in 2017 was $794,724 which is a 23% increase over the 2016 average sale price of $648,477 and 19% above the 12-year average Ocean Beach sale price, which is $665,913. The highest price paid for a home in Ocean Beach in 2017 was $1,606,000, which is 2% less than 2016’s high price of $1,646,250. The lowest price paid for an Ocean Beach home in 2017 was $400,000, up 92% from 2016’s low price of $208,133. Three homes sold in Robbins Rest in 2017, as compared to 2 sales in 2016. A typical year sees only one home trade in this small community, so 3 sales is a high volume year. While the volume of transactions increased, the average sale price was down considerably from $1,150,000 in 2016 to only $500,000 in 2017. This represents a 57% year over year decline in average sale price and a 34% decline from the 12-year average sale price of $756,854, however two of the three sales were of vacant parcels, thus explaining the lower price point. Saltaire had a surprisingly lackluster year in 2017. Sales volume was down 40% from 15 sales in 2016 to only 9 sales in 2017. While the year over year transaction volume decline was steep, when compared to the 12-year average volume of 10 sales per year, 9 sales per year is not atypical. The average sale price was also down year over year, from $1,326,582 in 2016 to $1,027,011, however the 2017 average sale price was still 8% higher than the 12-year average. Interestingly, the highest price paid in Saltaire in 2017 was $1,460,000, nearly 60% less than 2016’s highest price paid of $3,600,0000. In a typical year, the highest price paid in Saltaire is $1,963,182, which is 26% higher than 2017’s highest sale. The lack of high end sales mimics the data observed in Seaview, and the Fire Island Pines which typically trade at a similar price point to Saltaire. When looking at the median price point data, we still see a price decline, but a much smaller one. 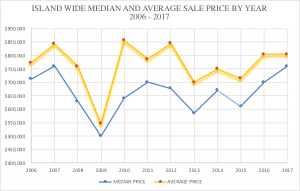 The median sale price in Saltaire in 2016 was $1,075,000, as compared to $1,020,000 in 2017, a decline of just half a percent. 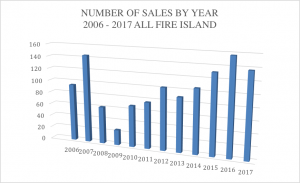 Seaview is traditionally considered one of the most desirable communities on Fire Island, but the past two years have seen a significant slump in sales. Only 8 Seaview homes traded hands in 2017, as compared to 12 in 2016 which represents a 33% decline in year over year sales transaction volume. However, when comparing to the past 12-year average of 9 sales per year, 8 Seaview home sales in a given year is not atypical. The average sale price was nearly flat, year over year. The average 2017 sale price was $838,581, as compared to 2016’s average of $839,250, both off 19% from Seaview’s 12-year average sale price of $1,032,550. The most expensive home sale in Seaview in 2017 was $962,500 which is less than half the price of the most expensive home sold in an average year, which is typically close to the $2 million mark. It is rare to see a year where nothing in Seaview trades above the $2 million mark, let alone the $1 million mark. The lowest price Seaview home sold in 2017 was $660,00, which was 26% higher than 2016’s lowest price Seaview sale of $525,000. While the average sale price declined by less than 1%, the median sale price increased by 15% from $750,000 in 2016 to $863,000 in 2017. It’s unclear why the Seaview market has been underperforming for the past couple of years. Given the small data set, I am inclined to think the lackluster sales figures don’t truly reflect a real drop in value but are driven by the fact that none of Seaview’s high value homes happened to have traded in the past 2 years. Due to its convenient location between Ocean Beach and Ocean Bay Park and considerable community amenities, Seaview remains in high demand among buyers, but quality inventory has been limited. We’ll see if 2018 sees a return to typical price levels in the community. No homes traded in the Summer Club in 2017. Given that the community is comprised of only 40 homes, that’s not terribly surprising, but a typical year does see 1.5 homes in the community trade. The 12-year average sale price in the Summer Club is $719,907. With several high-end homes currently for sale in the Summer Club, I believe 2018 will see at least a few trades in the Summer Club, likely at significantly higher price levels. Only one home sold in Water Island in 2017, for a sale price of $1,200,000. 2016 also saw only one home sale in Water Island, but at a higher price point of $1,55,000. While the year over year average price was 23% lower in 2017, it’s still 3% above the 12-year average sale price of $1,160,046. The strong Fire Island real estate market performance observed in 2016 continued into 2017, however was driven mainly by the middle and lower segments of the market. The top segment of the market (defined as $2 million and up) was completely dormant in 2017, while a typical year sees at least a handful of transactions upwards of the $2 and $3 million dollar price points. Despite this lack of activity at the high end, median sale prices were up and average sale prices remained stable, year over year. Cherry Grove, Corneille Estates, Fair Harbor, Fire Island Pines, Ocean Beach, and Seaview all saw drastic increases in their lowest price sale, year over year, indicating that inventory at the bottom end of the market has cleared. Because the Fire Island real estate market does not function like a traditional real estate market with a centralized multiple listing service, reliable market data is not readily available to the public. Our annual market reports are published in an effort to address that. Both buyers and sellers are served by being fully informed about the market in which they are considering transacting. Please do not hesitate to contact me at abigail@fireislandrealestate.com if I can provide any further information, or if I can be of help to you in the sale or purchase of your Fire Island home. Please note that all information herein is deemed reliable but not guaranteed. The information is sourced from public real estate transaction records. Sales data reporting has a lag of approximately 90 days. Due to this lag, there may be some outstanding sales that closed late in 2017 but have not yet been reported and are therefore not reflected in this report. From 2006 – 2017, the average number of transactions per year has been 99.